Belton Independent School District in Central Texas is relatively small in terms of size; however, it’s big on ideas. It became one of the first districts in Texas to implement a broad mobile technology program – pairing an Apple iPad with each student at South Belton Middle School and Belton High School. Today, Belton ISD hosts administrators and educators from around the nation to share what they’ve learned – best practices that includeinfrastructure, communication to parents, training for teachers and device protection from OtterBox. Edmodo – Connects teachers and students with a closed network to track grades, disseminate homework and collaborate on projects. SyncPad – a digital whiteboard that allows teachers to write and share notes to the classroom projector and every iPad in the room, which students can screenshot for review rather than transcribe for review. UPAD – this handwriting/drawing app is a digital replacement for spiral notebooks. iAnnotate – teachers can distribute digital worksheets for students to complete and submit on their iPads. iMovie – great for project-based learning, students can research, collaborate, film and edit assignments. When planning started for a new middle school, the district decided to deploy iPads with each of the 735 students enrolled. Access wasn’t necessarily in the cards for all students at South Belton Middle School. The school population consists of a relatively low socio-economic group, with 65 percent of the students receiving free or reduced rate lunches. The vision was to get a tablet device into the hands of every student at the school because greater access means empowerment for the children. That vision was realized through funding from a bond to purchase the technology, and teachers were instructed to incorporate the devices into everyday learning. Teachers have embraced the new learning tools and view them as a means to empower students to direct their learning. Seventh grade math teacher Nat Giambalvo recalls the days when he was stuck at a chalkboard, writing lessons and lecturing to his class. Those days are gone. Giambalvo uses apps to write and share his notes from iPad to iPad, to assign and collect homework and to get creative with a subject that has traditionally required a focus on copying formulas rather than facilitating learning through exploration. Many South Belton Middle School teachers have reported similar results – increased homework completion because digital worksheets cannot be lost, better one-on-one communication due to email access to teachers, and an overall increase in the a level of excitement about learning. Because of the success at South Belton, the district decided to roll out a 1:1 program at Belton High School as well. Between the two schools, pockets of classroom and 1:1 sets at other locations and those issued to teachers and administrators, Belton ISD has a total of 4,500 iPads deployed. Without a question, creativity and engagement abound throughout the district. However, when the program was in the early stages of planning there were plenty of questions and few answers. How will content be controlled? Is the IT infrastructure robust enough? What apps should be used? “The big question was how to protect them,” Schneider said. “In middle school, you’re probably the clumsiest you’ll ever be.”When news of the 1:1 program got out, the district received a number of protective covers to test. Schneider and team created a system to score the characteristics important to them, such as corner and screen protection, access to plugs and ports, etc. During the 2012/2013 school year, 86 of the 3,400 1:1 student iPads were damaged or broken for a rate of 2.5 percent. 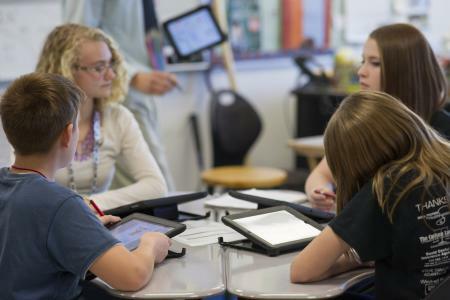 Compared to up to 50 percent reported at some schools and general user breakage rates of around 20 percent reported by an iPad insurance provider SquareTrade, Belton ISD considers their investment well protected and students securely connected. In backpacks, on desktops and for every drop, ding and bump, OtterBox is helping to keep Belton ISD’s students connected and empowered.